Customer Support Agreements Are A Great Way To Improve Customer Satisfaction And Can Be Very Profitable For Equipment Dealers. 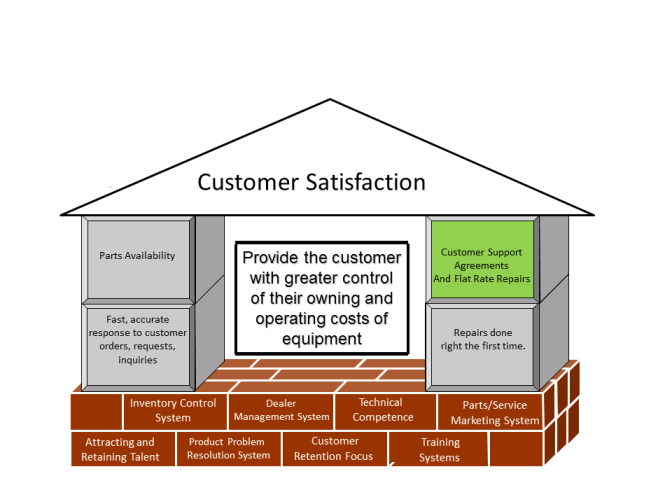 Customer Support Agreements (also known as CSA's) are one of the strongest ways to build customer satisfaction. For the same reasons that customers like Flat Rate pricing systems they like Customer Support Agreements because they have a clear picture of what their Owning and Operation cost are going to be. There are many customers who now require a CSA to be offered when they go out for a bid on equipment. I have seen dealerships be excluded from bidding on equipment either because the did not want to offer a CSA or could not offer one. The definition of Customer Support Agreement is an agreement or contract between the customer and the dealership to perform pre-defined work at a set price for a level of care for the equipment. What is offered in Customer Support Agreements? • Periodic inspection of equipment followed by a report of the condition of the equipment and a recommendation for repair and/or maintenance. • Parts pricing guarantee over a specified period of time and an assurance that the customer will purchase a set minimum during the contract time. • Repairs of all drive line components over a specified period of time at set (guaranteed) prices. • Guaranteed Availability Contract. A contract that guarantees the equipment will not fall below specified machine availability over a set time. There are many more types of CSA’s that can be offered (you are only limited by your imagination), the only requirement in your CSA offers is that they must be beneficial to both the customer and the dealership. • Typically, equipment under a CSA has higher availability due to unscheduled downtime. • Repair costs, over the expected life of a component, can be lowered by 50%. Through inspection and repair before failure, catastrophic failures are anticipated. One example of this would be replacing cracked cylinder heads on an engine. Most CSA's have an oil sampling program. The oil sampling program will determine if the engine shows anti freeze in the sample. The engine can have the cylinder heads replaced before the entire engine fails. A repair is performed rather than a complete replacement of the component. • A complete inspection and repair history is maintained making it easier for the customer to sell or trade equipment at higher retail values. • The residual value of equipment maintained under a CSA is always higher (up to 20% higher). This allows the customer greater opportunity to finance the equipment at more competitive rates. What are the advantages for the dealership? • Utilization of manpower (technicians) is improved since inspection, repairs; replacements are scheduled under a CSA. • If proper examination of the costs in a CSA are examined the contract can be very profitable. • The customer is retained for much longer periods of time. Competition has a difficult time participating in any Parts or Service work. • Customer satisfaction improves since the customer and dealership are in continuous communication about the condition of the equipment.